AFS Participants, Returnees, and Volunteers enjoy a “family style” picnic at a reception in Milford, Connecticut, during the summer of 1970. Photograph by Gutrick of Milford. RG4/001, the AFS International Records. This image cannot be reproduced outside the guidelines of United States Fair Use (17 U.S.C., Section 107) without advance permission from the AFS Archives. 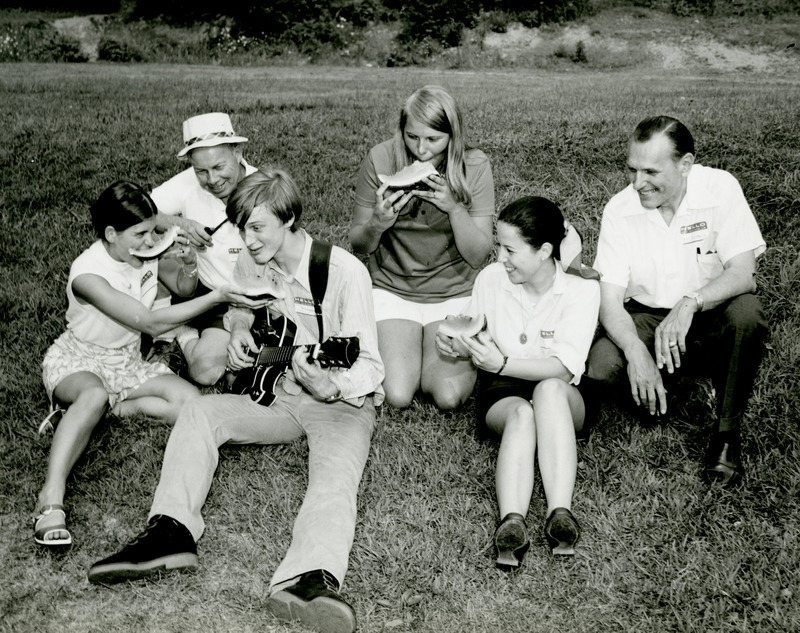 This photograph shows four AFS Participants and Returnees enjoying live music and fresh watermelon, a typical summer treat in the United States, at a picnic organized at Morningside Park in Milford, CT, in the summer of 1970. The president and vice president of the local chapter, which organized the event, are also present in the picture. The picnic was attended by AFS Returnees who were hosted in the region in the past and were visiting their former American host families during the summer, as well as new AFS Participants who had just arrived from abroad, and Returnees who were back in the United States and attending Milford High School. From left to right are: Ann Bertier (BFL-USA, 1968-69), Mr. Robert C. Miller (Milford Chapter Vice President), Karl Martin Drochner-Karme (GER-USA, 1970-1971), Milford resident Mary Zvirblis (USA-GER 1969-1970), Maria Soledad Ferrando Fuentes (CHI-USA, 1965-1966), and Mr. Vit Zvirblis (Milford Chapter President). As this image reminds us, AFS Participants become an essential part of their host families and communities through the strong relationships they form during their year abroad. Former AFS Participants often maintain connections with local chapters and travel to their host country to visit with family and friends, giving them the opportunity to meet and share stories (or watermelon and live music) with new AFS Participants and Volunteers.